Just 4 more trading days left for the February expiry series to come to an end. So far this expiry is brutal to the small cap and midcap investors. Lots of dumb longs got flushed out of the system and some more still pending to get flushed out. Media Channels are fear mongering on banking scams. If your mind is biased it is better to cleanse with top down approach. Monthly – Trend Balancing as price still balancing marginally above previous month low 10436.5 and on the weekly timeframe we got an inside bar and intermediate trend is down so far. 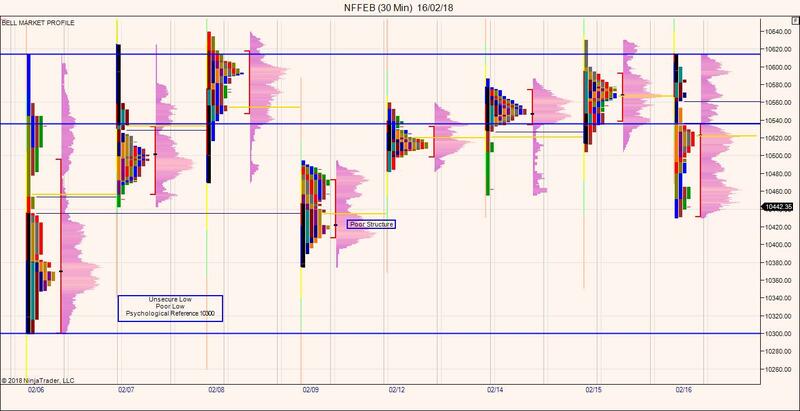 And daily timeframe we got a broader balancing zone dominated by short term players in the range 10400-10640 for the last 8 trading sessions. Last week global market mood has been changed from complete bearishness to bullish mode as US , European Markets and Asian Markets went into recovery mode except the Indian Markets due to prevailing local issues(RBI framework on stressed assets, PNBScam). And also Nifty trades below the current expiry support 10500. Price holding below 10500 might attract further selling pressure in the short term. Interestingly previous month low in Nifty Futures is attempted 3 times in the last two weeks alone and all the attempts to close below previous month low got failed. If Nifty Futures breaking previous month low (10435.5) then confidence of breakout has to be monitored as it serves as a critical reference for this series. Nifty Futures last Friday manages to close below 2 day low. Confidence of sellers are relatively strong since the start of the day though the price open higher and traded within previous days range. Thursdays Failed Auction and Poor Stucture got cleared in the first half of trading session finally price manage to break 10500 levels as well on EOD basis. Day ended with tripe distribution with value forming lower relative to previous day. 5)Lower Balance of Triple Distribution – 10536. Profile Sentiment turned negative last friday and long as price holds below 10536 technically downtrend is likely to persist. Nifty Future holding below 10500 could bring towards the visual references 10300 and 10100 levels. If Nifty Futures breaking previous month low (10435.5) then confidence of breakout has to be monitored for lower levels to revisit. Short term resistance are expected around 10500 and 10536 levels. Breaking and acceptance above that could move the market in a broader range between 10540-10800 range. Probably one can expect a revisit towards the weekly gap 10721 levels.